Sometime last year, I started following Stephanie over at A Year of CrockPotting. When I saw her make CHICKEN NUGGETS in the crock pot, I have to admit my skepticism. Chicken nuggets. Seriously? But then I didn’t think you could make bread in a crock pot either, and I proved that wrong last week, so I thought I’d give these a try. I cut the recipe down by half and made a few alterations in her original recipe to come up with the following offering for Thoughtless Thursday. The end results were definitely quite tasty and not soggy. The breading was a bit hard, but I think that could be avoided if you DON’T leave it on warm for three hours after they are done. So yes, Virginia, you CAN make chicken nuggets in the crock pot. First up, cut your chicken into nuggets. I aimed for 1.5″ ish cubes. Place the chicken onto paper towels to blot excess moisture off. Spray your crock pot (I used a 6 quart) with cooking spray. In a bowl, mix the Egg Beaters and buttery spray. Dump the breading (your choice) and the seasoning salt and garlic powder into a pie plate and mix. Now you’re going to do the assembly line thing. One hand dips the chicken into the egg and drops it into the pie plate. The other hand mounds breading over it and pats it on until well coated. That dry hand will place the freshly coated chicken nugget into the crock pot. Once the bottom is full (and I allowed about an inch of space between nuggets), place a sheet of aluminum foil with lots of tiny holes poked in it over the top. And if you come up with a good way to poke said tiny holes, let me know. The attempts I made with a fork were less than pretty. Give the top of the foil a spritz and continue layering nuggets. You may wind up with another layer of foil. Once the crock pot is all loaded up, with an extra layer of holey foil on top, use the handle of a wooden spoon to prop the top open to allow the steam to escape–this is how you avoid mushy nuggets. This works out to two servings at 335 calories and 2.25 grams of fat. 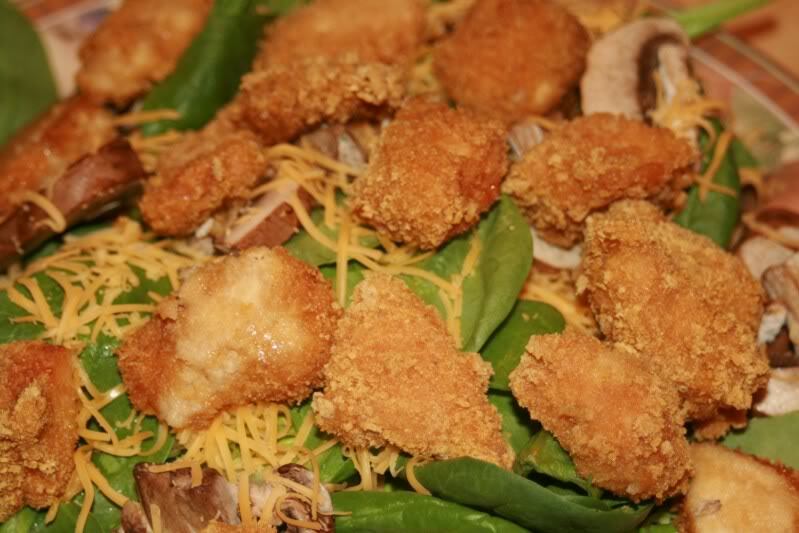 When’s the last time you had a full serving of chicken nuggets that were THAT good for you? Now it was just me all by my little lonesome this week, which makes for a short round up for y’all. So prep those slow cooker recipes and submit them for next week! And if you don’t have any, tell a friend! I’m very fascinated by the weird not soup/stew/roast type stuff you can make in a crock pot. I have a 3/4-inch shag rug. Placing 3 sheets of aluminum foil, on top of one another, I put them on the floor. Taking a bamboo skewer, I proceeded to poke holes all over the foil sheets. Worked great – lots of clean-cut tiny holes!